Max’s Deli and Bakery is Vancouver’s best delicatessen and source of baked goods. Start with Breakfast, enjoy Lunch, and let us serve Dinner! 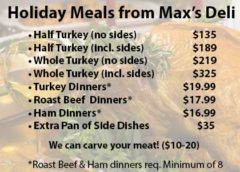 Order Holiday Meals, Catering and Cakes Online with Maxs!My blog Max’s Deli and Bakery is Vancouver’s best delicatessen and source of baked goods. Start with Breakfast, enjoy Lunch, and let us serve Dinner! Order Holiday Meals, Catering and Cakes Online with Maxs!My blog – Max’s Delicatessen and Bakery, Quality Since 1949! We make delicious baked goods every day! Delicious options for Holiday meals, including Turkey, Roast Beef and all kinds of wonderful sides! 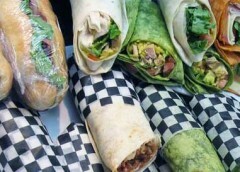 Max's Caters any event with coffee, sandwiches, soups, platters, and more! Max's Deli & Bakery, Vancouver Max's Deli & Bakery, Vancouver shared a post. 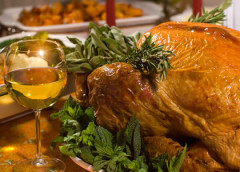 Hosting dinner this Christmas? Why spend hours in the kitchen when you could be having fun with family and friends. Let Max's deli do all the cooking for you. Don't forget to place your order. Today is the last day - accepting orders until 2pm. Call the store at 604-733-4838 or place your order online. Just in time for Valentine’s Day, new flavors of macaroon's available for limited time. Call us now to place your order.